Hanley Ramirez back in his minor league days. He’ll be wearing a much lower number this time around. With apologies to The Odd Couple – On November 24, 2005, Hanley Ramirez was asked to remove himself from his place of residence. That request came from Boston Red Sox management, who sent him to the Florida Marlins in a deal for Josh Beckett and “throw-in” Mike Lowell. Ramirez knew the Red Sox were right, but he also knew that some day he would return to them. Nine years later, to the day, Ramirez is set to return to Boston as a free agent. A reported five year, $90MM deal (I laughed when I saw someone call it a bargain) has been agreed upon. UPDATE – Foxsports’ Ken Rosenthal has now reported that the deal is four years at $88MM with a fifth year added on as a vested option. 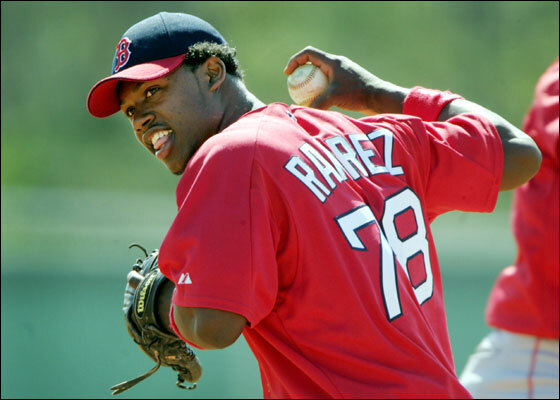 Ramirez was signed by the Red Sox as an amateur in 2000 and made his Boston debut in 2005. He appeared in just two games and that offseason was dealt to Florida in the aforementioned deal. Both Beckett and Lowell went on to become integral parts of the Red Sox 2007 championship. Ramirez captured the NL Rookie of the Year in 2006 when he hit 17 home runs, drove in 59 runs and stole 51 bases. He remained with the Marlins into the 2012 season by which time he was having issues with management. At the 2012 trade deadline, he and Randy Choate were sent to the Los Angeles Dodgers for Nathan Eovaldi and a minor leauger. Injuries limited him to 86 games in 2013, but Ramirez hit .345 and slugged .638 to finish 8th in the NL MVP vote. Last year he had a more modest slash line of .283/.369/.448 in 128 games. Will Lester get the ball back in Boston? We’re less than two days away from the Major League Baseball trade deadline and the number of rumors is starting to add up. The biggest name among them is Boston Red Sox ace Jon Lester. The veteran left-hander has been scratched from his Wednesday start, which means Boston will be making a heavy push to trade him for a boatload of prospects and/or Major Leaguers prior to Thursday’s 4 pm EDT deadline. With the team and Lester unable to agree on a new contract to keep the left-hander in Boston beyond this year – he becomes a free agent after this season – a trade is now very likely. Lester’s a grade ‘A’ player; a top performer, team leader, and whose departure would leave a major vacancy in the Red Sox rotation. The 30-year old, who beat anaplastic large cell lymphoma eight years ago, holds a 110-63 (.636) record as of this writing and is enjoying one of the best seasons of his career. His K’s per nine innings (9.4) is the highest in four years and he has career bests in ERA (2.52) and WHIP (1.119). He’s also been solid in the post-season. Last year he helped lead the Red Sox to their third World Series title in 10 years. He won four games, including two in the World Series victory over the St. Louis Cardinals. It will be difficult to cut the cord, but if the Red Sox truly feel they cannot resign him, they might as well try to deal him. Needless to say, they’ve getting calls from many teams. That includes the Pittsburgh Pirates, who last night emerged as a “dark horse favorite”. 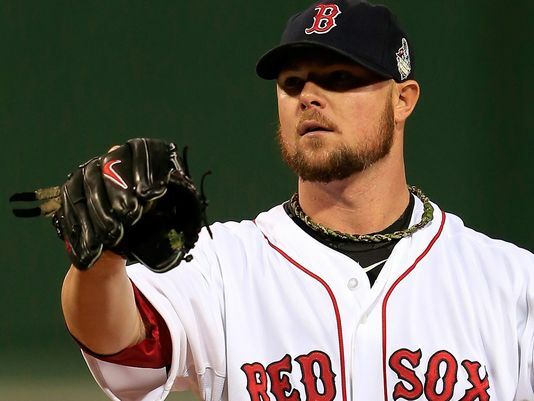 Lester could be part of a Boston fire sale now that the Red Sox have dropped 12 games out in the AL East and 9.5 games out of the second wild card position. The team, which dealt starter Jake Peavy to San Francisco on July 26, has been fielding calls on John Lackey, Koji Uehara, Andrew Miller, and Jonny Gomes. The Red Sox are also rumored to be interested in Matt Kemp, which makes no sense whatsoever. The injury-plagued LA Dodgers outfielder is owed $107MM over the next five seasons. The Red Sox would be better off spending money on starting pitcher. They don’t have to look that far back to see how injured and/or overpaid players (Carl Crawford, Adrian Gonzalez) failed in Boston. The next best pitcher available is Cole Hamels. After not being able to pull off a Cliff Lee deal so far, the Phillies have reportedly either been shopping Hamels or steadfastly refusing to trade him. Even if Hamels is dealt, the Phillies would like to deal Lee and the minimum $37.5MM he stands to make the next two years. He’s also owed the remainder of $25MM this season. Lee will not command the return of players he once was able to unless Philly eats the majority of the salary. Hamels stands to make $90MM through 2018, with a possibility of making an addition $20MM-$24MM in 2019. Like Lester, Hamels is 30-years old and is having a very good season. Tuesday night he tossed eight shutout innings in a win against the New York Mets. It lowered his career-best ERA to 2.55 and a very good ratio to 1.128 His 9.2 strikeouts per nine innings is his highest total since 2006. The Phillies certainly won’t give him away and are probably going to hold on to him. Like the Red Sox, the Phillies could move several players. Outfielder Marlon Byrd is in high demand and inquiries have been made about A.J. Burnett. The Phillies would love to rid themselves of Ryan Howard’s remaining $60MM over the next three years (the last year is an option with a $10MM buyout. ), but that’s not likely to happen. Other pitchers that could move today are the Mets’ Bartolo Colon, who has one year and $11MM remaining on his contract. The Minnesota Twins would part with Kevin Correia, though there isn’t much demand for a pitcher who leads the AL in losses and whose ERA is over 5. The Twins have also been fielding calls for catcher Kurt Suzuki and outfielder Josh Willingham. The Kansas City Royals will likely lose James Shields to free agency after the season, but with the team five games behind Detroit in the AL Central and 3.5 games behind Toronto for the second wild card, how could they not keep him? The Cleveland Indians face a similar dilemma. They’re 6.5 behind Detroit and sit five games in back of Toronto. Do they think they can make a run and become buyers or do they go ahead and become sellers? The Indians are a team that might try to do a little of both. Rumor has it they are trying to move starting pitcher Justin Masterson, who is having a disastrous season. Another player having a bad year is Nick Swisher (.615 OPS as of this writing), though the two years and $30MM will make it harder to move him. Add on his failure in several post-seasons, and Swisher won’t bring much return at this point. Shortstop Asdrubal Cabrera could be in a new home by Friday, as he enters free agency after this season. The Padres are reportedly shopping reliever Joaquin Benoit, who can either set up or close. Other players that could move on are pitcher John Danks, outfielder Dayan Viciedo, and 1B/DH Adam Dunn of the White Sox, pitcher Colby Lewis and outfielder Alex Rios of the Rangers, Cubs’ Pitcher Edwin Jackson, Rockies pitcher Jorge De La Rosa, and Diamondbacks outfielder Gerardo Parra. Cleveland sent Justin Masterson to the St. Louis Cardinals for outfield prospect James Ramsey. Masterson has been having an off-year in a contract year, but the Cards are hoping he can be the second coming of Jake Westbrook. The Cardinals depth in the outfield allowed them to deal Ramsey, the 23rd overall pick in the 2012 draft. Miguel Cabrera hits a two-run home run off pitcher Ryan Webb for his 2,000th career hit. 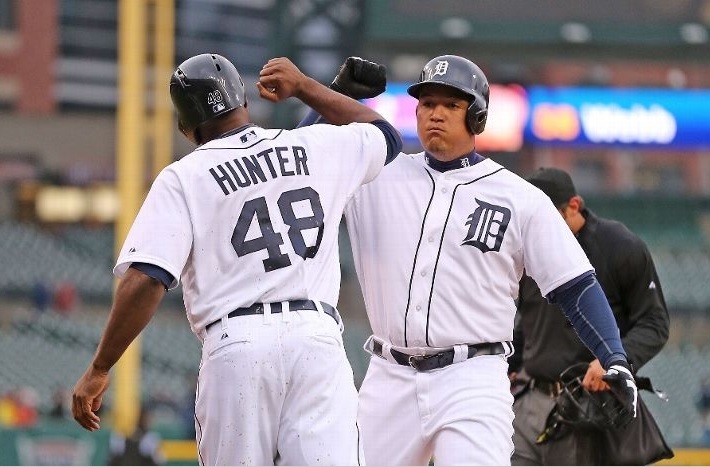 Miguel Cabrera entered the 2,000-hit club in grand style, going 4/5 with a home run and three RBIs. His two-run shot off pitcher Ryan Webb in the eighth inning made him the 277th player in Major League Baseball history to reach that impressive milestone. Next in Cabrera’s sights is Jason Giambi (2,002 hits). Raul Ibanez (1,995 hits) may soon be the 278th member . In his MLB debut, Cabrera collected his first career hit, which was also a home run. On June 20, 2003, the Florida Marlins defeated the Tampa Bay Devil Rays 3-1 in 11 innings. Cabrera was 1/5 with a home run and 2 RBIs. He hit the game-winning home run in the 11th off of pitcher Al Levine to give the Marlins the victory. Since then, Cabrera has evolved into one of the best hitters in baseball, with nine seasons of 30-plus home runs and 10 consecutive seasons with 100-plus RBIs. Heading into tonight’s game, Cabrera had 1,996 hits, 365 home runs, a career .321 AVG, .399 OBP and .966 OPS. Should Cabrera’s offensive production continue at this pace, and if he stays healthy for another four or five seasons, he will likely be a shoo-in for the Hall of Fame. Cabrera was off to a slow start this season (1/7 with zero RBIs in two games), after signing an enormous contract extension with the Detroit Tigers. The contract drew criticism from baseball pundits, fans, and the 29 other MLB clubs. Although Cabrera is still arguably the best hitter in baseball today, there is cause for concern with the extension. One need look no further than Albert Pujols, who left the St. Louis Cardinals and signed a lucrative deal with the Los Angeles Angels of Anaheim as a free agent years ago. Pujols was widely regarded as the best hitter in baseball, but quickly declined and struggled with injuries as an Angel. Pujols is still a very productive hitter, however his statistics over the past few years do not justify the contract he signed with the Angels. Until there is news of Cabrera struggling with injuries or a prolonged slump (two games does not a slump make), there is no reason to believe he could not win another MVP award this season. Since joining the Tigers in 2008, Cabrera averaged 156 games played, 37 home runs and 122 RBIs. He hit 44 home runs in back-to-back seasons in 2012 and 2013, with 137 and 139 RBIs, respectively. The 2008 season (.292 AVG) was the last time Cabrera hit below .324 and the last time he registered an OBP lower than .393 (.349 in 2008). Concerns about his contract extension aside, Cabrera has demonstrated excellence as a hitter throughout his career and will continue to add to his legacy as one of baseball’s best hitters. His past 11 seasons have showcased a display of greatness that will be difficult for others to match. Christopher Wenrich is a contributor for Designated For Assignment. Follow him on Twitter (@DuggerSports).